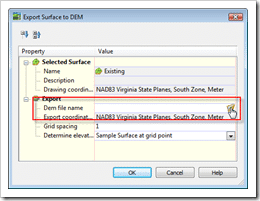 One of my users called me the other day asking if there was any way to convert our DTM surface into a DEM surface, as a client had called them asking if it was possible. The short answer to the question was yes, but let me review the fundamental differences in these formats before getting into the how-to of this task. Both formats exist for the same fundamental reason – to capture a representation of the earth’s surface. What differs is the way each stores that data. A DEM or Digital Elevation Model stores this information using a predefined grid of squares. Thus imagine a piece of graph paper; at each point two graph lines intersect, an elevation will be assigned. This format is an effective way of representing surfaces, but due to it’s rigid nature isn’t necessarily the best choice for civil engineering design. And it is with that we have our second format – DTM or Digital Terrain Model. 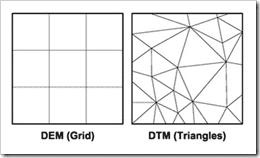 Unlike a DEM, a DTM captures a surface through the use of a triangular irregular network. 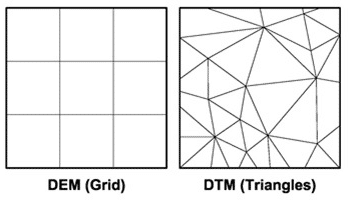 In essence, rather than using squares to capture a surface, a DTM uses triangles. At the corner of each respective triangle, an X, Y, & Z elevation is captured and stored. Since the triangular network is irregular, the TIN is generally better at capturing things like flow lines. 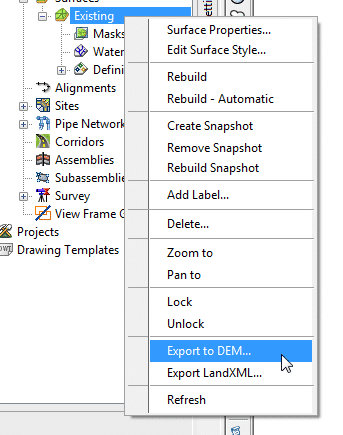 Although Civil 3D’s native modeling format is DTM, it does have the ability to export a surface to a DEM file. 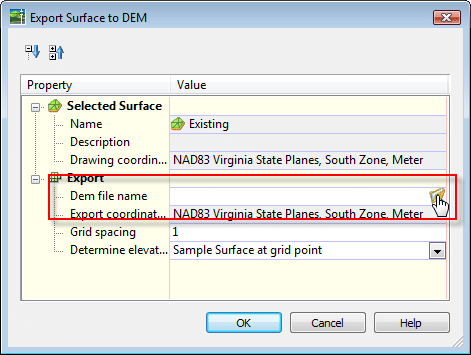 In addition to the architectural differences between DEM and DTM surfaces, the DEM format only accepts metric coordinate systems. International users don’t necessarily have to worry about this detail, but those using imperial coordinate systems will need to convert their surface to a metric coordinate system. With that said we’ll have to perform the coordinate conversion manually. For purposes of this post I am going to use the LandXML format as a carrier to convert from one coordinate system to another. Since all we’re interested in is our surface, accept the defaults and press [Ok] to save your XML file. From the Civil 3D Toolspace select the “Settings” tab. 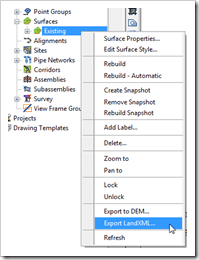 Import your XML surface by going to File > Import > Import LandXML. Selecting your XML file from the resulting dialog. 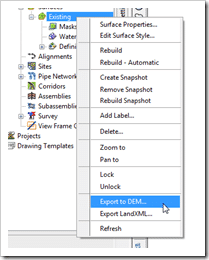 Generally speaking you can accept the defaults from the resulting “Export Surface to DEM” dialog. One setting you may experiment with is the “Grid spacing”; the larger the number the less accurate your DEM. Aside from that, simply specify an output file name and press [Ok]. I have struggling with the same issue. Has anyone resolved this? i hope this blog is been active until you read my comment..!! would you help how to fixed that sir…?? Do you have any idea why I might be seeing this, and if I can see it on the CAD side? You generally see those kinds of messages when there is a missing projection file. Try defining projection of raster using ArcToolbox (either in ArcCatalog or ArcMap) to the coordinate system that you are using. If there is already a projection defined, then reproject raster to a similar coordinate system of your data. Hope this helps. I’ve been trying to export DEM’s from Civil 3D but have noticed that my elevation accuracy gets lost, and rounded up to a whole number (no decimals). Is there a way to export to a DEM and maintain a reasonable accuracy in the elevations? I’ve tried fiddling with some of the parent drawing settings, but cannot seem to find anything that will allow me to transfer the data to DEM with anything but a “nice” round number. can we create a dem file frm dwg file in normal autocad 2006? @bhairava To create a DEM within AutoCAD, you must have a vertical product like Civil 3D. Neither the 2006 release, or any other release of base AutoCAD can. 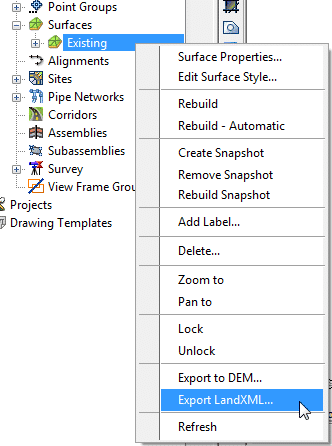 I saw your blog on creating a dem file from tin surfaces in Civil 3D. I have a question: is it possible to select multiple surfaces in order to create one dem file? If you know of a way please educate me on this matter. I am rushing of course with work material and this is where I am holding up. Any help would be much appreciated. @Earl – Since I almost always work in State Plane Foot coordinates, it seems I may have mispoken on the metric thing. In this case I was working in State Plane Foot, and the only coordinate system accepted was the State Plane Metric. In any case I do appreciate your detailed comment. Here in Virginia the coordinate shift isn’t as drastic as it seems to be there in Alaska. Thanks again! I’m not finding anything in the DEM file specification that says it must be in a metric coordinate system. The early USGS DEMs were in UTM, which is metric by definition, yet the USGS spec allowed imperial units for elevation. Meanwhile, newer DEMs, non-US (at least Canadian that I have experience with) are gridded on lat/long, which is definitely not metric. Meanwhile, there is no mathematical reason for a DEM to need any given system. The tricky part, and the reason you need to convert to the desired coordinate system BEFORE you output to DEM (and why you can’t read from DEM to a grid surface with translation) is that a square, when transformed into another coordinate projection, is no longer a square! Sometimes it may appear so out to a number of decimal places, but mathematically it ain’t so. Especially for lat-long – in my latitude (Anchorage, Alaska) lat/long DEMs project out no something closer to 2x rectangles in UTM or State Plane.